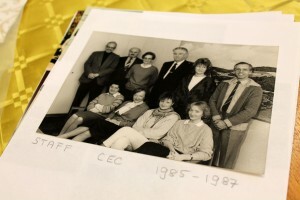 Archival photo of CEC staff during the 1980s. Photo: Erin Green/CEC. The Conference of European Churches emerged from the fragmented and divided Europe of the 1940s and 1950s. Following the Second World War, there was a real need in Europe to overcome political divisions, and work for healing and peace. At this time a small group of church leaders in East and West Europe began to consider the possibility of bringing together churches in European countries separated by different political, economic, and social systems.Their hope was that churches could become instruments for peace and understanding throughout a wounded continent. First preparatory meetings took place in 1953 and 1957, and by 1959 representatives of more than 40 churches met in Nyborg (Denmark) for the first official assembly of the Conference of European Churches. A new era in European ecumenism was born. Two more assemblies followed shortly thereafter, and the adoption of a constitution in 1964 marked significant moments for the fellowship of churches in Europe. The 1964 assembly was held at sea aboard a ship, the M.V. Bornholm, to overcome last-minute visa difficulties. The fifth assembly, held in Pörtschach, Austria in 1967, created a full-time secretariat, which opened in April 1968. Today the Conference of European Churches (CEC) is a fellowship of some 114 Orthodox, Protestant, and Anglican churches from all countries of Europe. A network of National Councils of Churches keeps us connected to national and regional concerns and Organisations in Partnership develop our expertise in a number of areas, including diaconia, migration and refugee issues, and women and youth in the churches. We now have offices in Brussels and Strasbourg.